The St. Andrews Cross Spider (Argiope keyserlingi) is a common species of orb-web spider found on the east coast of Australia, from central New South Wales to southern Queensland. 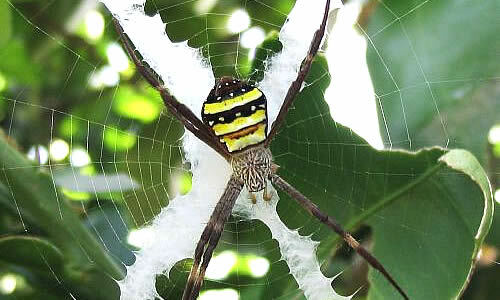 The St. Andrew’s Cross Spider is very similar in appearance to the closely related north Queensland species, Argiope aetherea (another common, large orb-web spider). The X shape is called the St. Andrew’s cross because it is believed that the saint was martyred on a cross of this shape rather than the conventional cross shape. St. Andrew’s Cross Spiders are named for their bright web decorations. They have zigzag ribbons of bluish-white silk that form a full or partial cross through the centre of the orb web. Females have a silvery carapace and a silver, yellow, red and black banded upper abdomen with two longitudinal yellow stripes below. The St. Andrew’s Cross Spider sits with the legs in pairs. The brown and cream coloured males are smaller than females. The body length of the male measures around 3 – 4 millimetres while the females are larger at 10 – 16 millimetres. Like many other spiders, only the female St. Andrews Cross spider builds the webs. 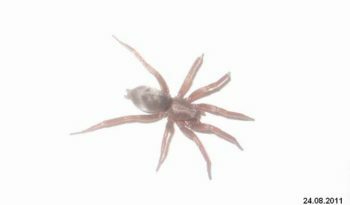 These spiders build medium-sized orb webs, occupied day and night, on low shrubby vegetation. These orb webs are 38 – 50 millimetres wide and contain only 2 stabilimentum (conspicuous silk structures). Argiope versicolor, which is found inland, makes the ‘full’ cross with 4 stabilimentum. The zigzag lines of their webs match their leg positions, which lead some people to suggest that this helps give the appearance of longer legs. Some spiders build a single vertical line, yet others a patch of zigzags in the centre of the web. No matter what the design is, this spider sits right in the middle of the web at all times. When prey is caught in the web, the spider throws out broad swathes of white silk to immobilise the prey, then rapidly rotates it to tighten the binding before administering the fatal bite. Small spiders which are unable to rotate the prey, run around the prey instead as they throw out binding silk. 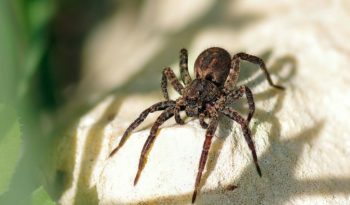 When threatened, the spider responds, either by dropping from the web or shaking it so vigorously that both spider and stabilimentum become a blur which confuses the attacker. These measures do not always succeed, as indicated by empty, damaged webs and the presence of these spiders as food in the mud cells of wasps. St. Andrews Cross spiders prey includes flies, moths, butterflies, beetles and bees. 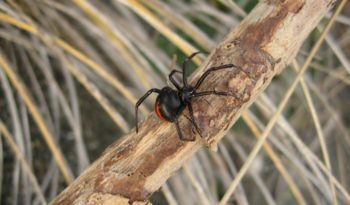 These are usually secured by silk wrapping into a neat parcel before being bitten – although smaller prey may be bitten first. Mating occurs in summer-autumn The male spider is much smaller than the female and unassumingly marked. When it is time to mate, he spins a companion web alongside the females. After mating, the female lays her eggs, placing her egg sac into the web. The sac contains between 400 and 1,400 eggs. These eggs hatch in autumn, however, the spiderlings overwinter in the sac and emerge during the spring. The egg sac is composed of multiple layers of silk and designed to protect its contents from damage; however, many species of insects have been observed to parasite the egg sacs. 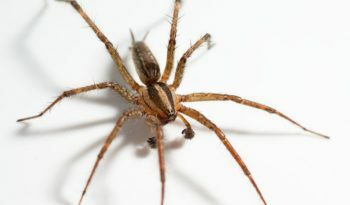 The bite of the St Andrews Cross Spider is of low risk to humans. St Andrews Cross Spiders are a non-aggressive group of spiders. 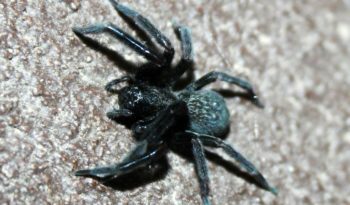 There are no reported instances of any serious consequences of human contact with these spiders except the fright of walking into their large web and the spider crawling over the person involved. St Andrews Cross Spiders are spectacular and may be quite alarming if one is not familiar with them, however, they are not dangerous. They might bite if grabbed, however, other than for defence they have no interest in biting humans. Their venom is not regarded as a serious medical problem for humans.